“Squirrel Circa 2089” by Kent Paulette. Every West African group has its favorite animal trickster, the most famous of which is no doubt the spider Anansi. For the Kapsiki of north-eastern Nigeria and northern Cameroon, no animal is trickier than the meke, the striped ground squirrel who scuttles throughout the bush. It may look cute and innocent, but the squirrel is reputed to have a strong dangerous bite that can easily get infected. It is also known to wreak havoc on the peanut harvests in the Mandara Mountains where they are cultivated as a major cash crop. No humans ever feature in the squirrel tales: of all the animals, the squirrel is the most human. So human in fact, that when his family is mentioned in some tales, it seems to be implied that they are human. 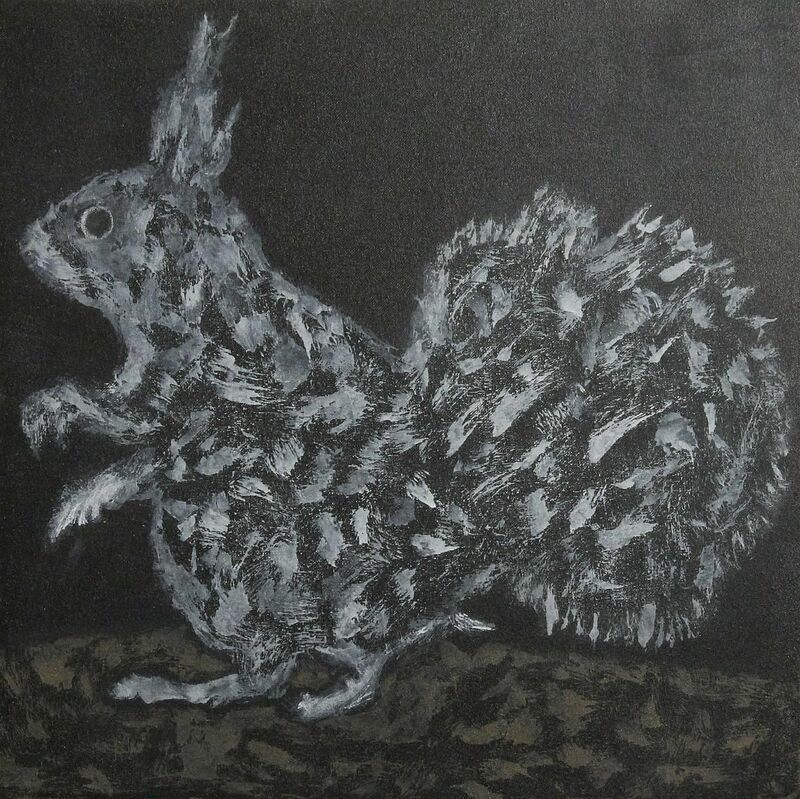 The squirrel, tricky, clever, but also deceitful and often cruel, embodies the human condition for the Kapsiki, illustrating the constant struggle against a stronger enemy. Cleverness — ntsehwele in Kapsiki — is vital to one’s survival, especially when the Kapsiki have often historically been in a minority position against their dominant Fula enemies of old. The most famous Squirrel story that every Kapsiki knows, is Squirrel and the Peanuts. Squirrel’s co-mother cultivated peanuts in a wet part of the bush and asked Squirrel to keep a watchful eye on the crop. His father asked him to signal when the plants would almost be ripe for harvest in order to organize a harvest party. Squirrel remained in the field, and when he came back to the village the people asked how the crop was doing. “The peanuts are just sprouting,” he answered, though the plants had in fact already flowered. A few days later, people asked again, and he answered that the sprouts were growing well, while the stalks were actually already re-entering the soil. A few weeks later people asked about the field, and he answered that the flowers were starting to bloom, while actually the fruits were forming. A week later he reported that the flowers were settling down, while the peanuts were almost ready for harvest. “What about our peanuts now,” his co-mother asked. “The stalks are entering the soil,” Squirrel answered, but he was already busy with the harvest, putting the peanuts in a huge termite mound. A week later: “How are my peanuts?” “Harvest in three weeks,” Squirrel answered, while in the field he put pebbles in the ground around the plant stems. When the indicated harvest time arrived, the woman set out for the field but found only pebbles in the ground. “I will send for him,” her husband said, and sent his neighbors to catch him, but in vain, because Squirrel refused to come home. “What now? How do we get Squirrel home?” his father asked, and on their advice he pretended to be dead. The people decorated him lavishly and seated him on a chair in the forecourt. Then they set out for the bush and told Squirrel that his father had died. “It is not I who is the oldest son.” Squirrel responded. “Call upon my brothers.” His brothers were called and came; only Squirrel was missing. “Come and mourn your father.” During the obsequies they put sesame before the ‘corpse’ for eating, and Squirrel came and started to wail: “My father, who gave me such large pots of meat,” and he took the sesame and ate. When he took the sesame for the third time, his father caught him. “Please unwrap me, folks; we are going to punish Squirrel.” The people disrobed his father and bound Squirrel with strong ropes, suspending him in the nook of the dabala [the entrance hut serving as a vestibule between the forecourt and the house proper]. Beneath him they put a large fire, burning peppers, tobacco, and euphorbia, so a large cloud of burning smoke stung his eyes and Squirrel suffered, eyes and nose running. Leopard entered the dabala and saw Squirrel hanging on high. “What are you doing there, cousin,” he asked Squirrel. “They have put me here to give salt to whomever wants it,” Squirrel answered. “Give me some salt, please, cousin.” Squirrel dropped a large lump of snot onto Leopard. “Get me down, so I can relieve myself, and I will come back and give you more,” Squirrel said. Leopard climbed up and untied Squirrel, and Squirrel seized him and bound him at the spot. When the father of Squirrel came back from the bush, he found Leopard hanging from the roof. “Who has put you there?” he asked Leopard. “Squirrel put me here when he went to relieve himself. But he will come back,” Leopard assured him. The people took Leopard down and started to beat him with sticks, pam pam [ideophone for beating with a stick], and Leopard fled at full speed. “Blue Squirrel” by Kyle Walters. “This rock is going to fall; it is falling down, you see? Stand here and hold the rock up,” urged Squirrel. “I will go and look for a pole to hold it up.” Leopard took up his place to support the rock, and Squirrel went back to the termite mound to play his guitar and sing. “This rock wants to fall down; that is why I am holding it while Squirrel is out to cut a supporting pole,” Leopard explained to Duiker. “This rock wants to fall down; that is why I am holding it while Squirrel is out to cut a supporting pole,” Leopard explained to Elephant. “Wait, I will see whether that rock will fall,” Elephant said, and he climbed onto the rock and danced on it. The rock stood steadfast. “Squirrel has tricked you,” Elephant explained, and Leopard went to find Squirrel again, who sat playing his guitar on the termite mound. Leopard pushed him into the hole. “Now you cannot escape from that spot. You have tricked me all day; and were it not for cousin Elephant, I would still be under the rock,” Leopard exclaimed. And when he saw Kalao nearby, he called him: “Come over and keep a watch over Squirrel, while I get my digging iron to dig him out. And meanwhile blow into the hole.” Kalao complied and sat down when Leopard went away. Down in the hole he saw Squirrel chewing on something: “What are you eating there, cousin?” Squirrel took a handful of termites and threw them into the eyes of Kalao, and the termites bit the bird in the eye. Kalao rubbed his eyes and Squirrel escaped from the hole and fled. “I have been here; I ate nothing, but he threw termites in my eyes,” Kalao said. “No, you have let Squirrel escape,” retorted Leopard, and he killed Kalao and ate him. Van Beek, W. E. A. (2017). 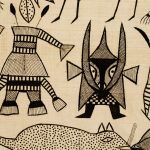 The Transmission of Kapsiki-Higi Folktales over Two Generations: Tales That Come, Tales That Go. London, UK: Palgrave Macmillan. pp 44-46.